When commuters opt to ride a scooter instead of driving a car, they typically do so for three reasons: a scooter costs less to drive and maintain than a car, scooters are typically better for the environment, and it’s much easier to find a parking space for a scooter than a car. In an effort to improve both the cost and the footprint (environmental and physical) of electric scooters, the Smart Cities Group at MIT designed the Roboscooter: a small, simply-designed scooter that runs on Lithium-ion batteries and folds into a compact area for parking and storage. The Roboscooter was designed to function equivalent to a 50cc gas-powered scooter, but it’s silent and clean, and it takes up much less parking area than a conventional scooter. Their batteries are small enough to be removed easily, facilitating simple home recharging or even carrying around spare, charged batteries. 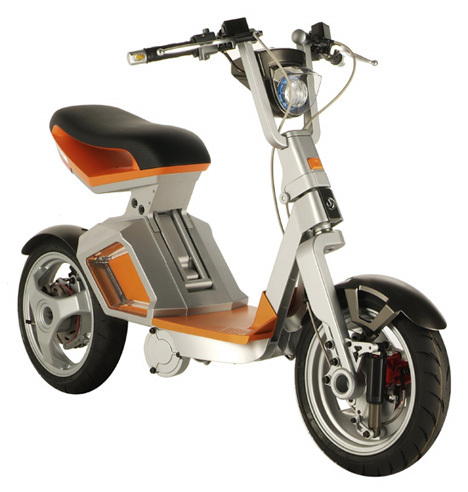 The scooter could alternatively be charged on its rack when parked at home. The design of the Roboscooter is much less complicated than other scooters, only requiring about 150 parts to the conventional scooter’s 1000 to 1500 parts. 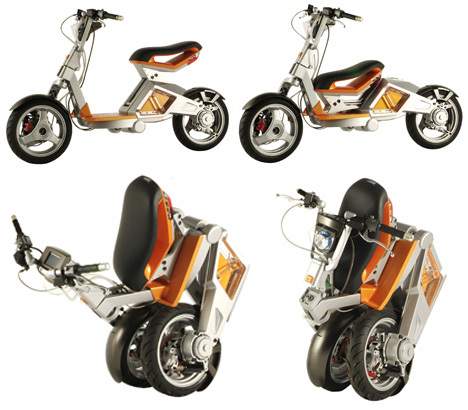 The simplified design means that the Roboscooter would be much less expensive than other types of scooters, and repair and maintenance would be easier. See more in Concept Vehicles or under Transportation. January, 2010.